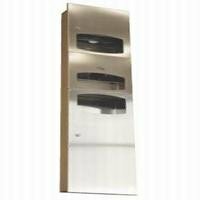 The Dolphin BC 22 SCA Recessed Combination Unit finished in Satin Stainless Steel is an exclusive system incorporating warm-air hand dryer, paper towel dispenser and bin into a single convenient solution. Primarily targeted at more prestige business operations, the Dolphin BC 22 SCA with it's satin stainless steel finish helps give the washroom a more luxurious look that will impress customers, clients and staff alike. In use the Dolphin BC 22 SCA Satin Stainless Steel Combination Unit's 2.2kw warm-air hand dryer is both quiet and efficient. The dryer will switch on when it detects the prescence of the users hands and then run for a optimal length of time before automatically switching itself off. The BC 22 SCA Satin Stainless Steel Recessed Combination Unit is designed to be recess-mounted and when in place projects only 12mm from the wall making this more discreet than most other electric hand dryers, paper towel dispensers or bins than can perform just one role.The dimensions required for the recess are a height of 1614mm, a width of 330mm, and a depth of 156mm. The Dolphin BC 22 SCA Satin Stainless Steel Recessed Combination Unit has total dimensions of 1660mm height, 370mm width, and 161mm depth.